Welcome to the first in my series of Successful Ladies of Brisbane. Brisbane's Lady of Baking is Jocelyn Hancock. Jocelyn's name is synonymous with quality baking in Brisbane. After establishing her artisian bakery Jocelyn's Provisions and spending 14 years successfully turning that business into an iconic and delicious Brisbane brand (Jocelyn sold the business in 2009), Jocelyn is now living her dream of baking with clean, fresh, quality, locally sourced produce at Cake and Bake, West End. How did you get your idea/inspiration for your business and what you do? Nadine Ingram of Flour and Stone is a superstar to me. She is someone I connect with, her ethos, her style. The comfort I feel when I walk into her Woolloomooloo shop takes me back to Jocelyn's Provisions, the dim light, antique furniture, the quirkiness and I like the fact that the shop is full when 3 people are in it. 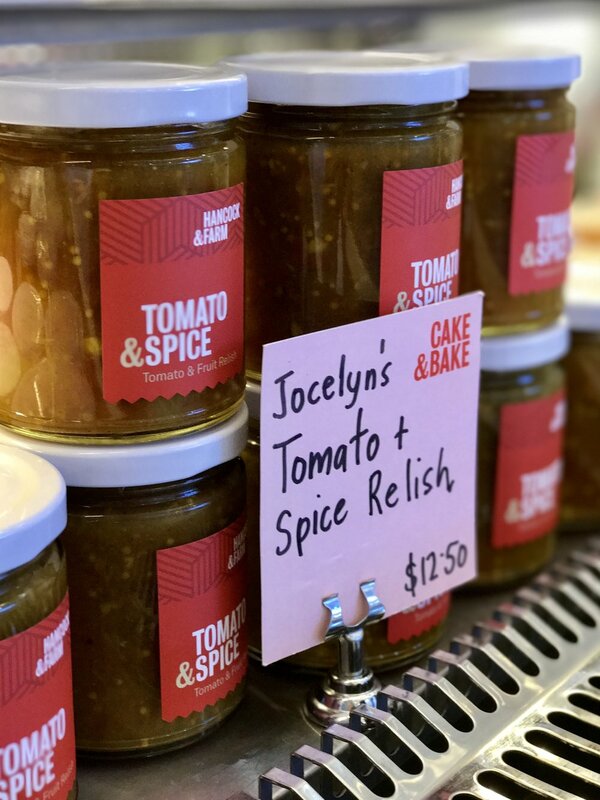 Nadine is a regular girl who likes to bake - she was the inspiration for Jocelyn's Provisions. Also I find if I do a quick trip somewhere I am motivated and enthusiastic, it clears my business head. Sometimes you get scrambled when you are in the business and you need to step out of it. Jocelyn was raised in Killarney and still owns a property in the beautiful Southern Darling Downs. Jocelyn is married with two children and on free weekends the family enjoy travelling to their country property in Killarney. Brisbane's Lady of Baking admits that it's hard to juggle your days when your husband is a shift worker and the children have sport and social commitments, she believes that being organised is the key. Spending time at Killarney is also definitely a location of inspiraton and relaxation for Jocelyn. What is the one piece of advice you would give to anyone reading this? What I have learnt is that being a hard marker is your hardest challenge because you are putting the pressure on yourself to perform. You mark yourself harder than anyone else, so dealing with that has to be your greatest challenge, this is always my greatest challenge. I eat more savoury food than sweet - fact. I love spicy rocket from the garden and lemon juice with soda. I worked at Yungaba in 1998, my kitchen was there, this was when it was a government 'arts' residence and it was the most amazing time. I worked there for 2 years and could work night and day because power was cheap and I could run the bread ovens all night. When we had our breaks there at night, there were lots of musicians playing and we would go and sit out under the fig trees and listen to the music. It was so good because you could hear the music and smell the bread and then you would hear the oven timers go off and go back into the kitchen - it was amazing. I baked out of Yungaba for the Brisbane Broncos and then Qantas wanted me to bake bread for them and I had to move to bigger premises. This was when I moved to James Street and I also bought a warehouse on Commerical Road and turned that into a bakery. Definitely the introduction of more whole food hubs, like Wooloongabba and more suburban food hubs like Fish Lane in South Brisbane. Brisbane is growing into a bigger city and people are living, working, eating and educating in that same zone - people are living a much more contained life. Going to GOMA - I love the space and the calm feeling of the interior. To me walking into GOMA is calming and refreshing. In a foodsense my favourite has to be Northey Street Organic Market and Micks Nuts at West End. Teneriffe Park at the top of Chester Street. Eat the cleanest and most delicious food you can afford. I hope you have enjoyed reading my first Successful Ladies of Brisbane post, leave me a comment and let me know what you think.